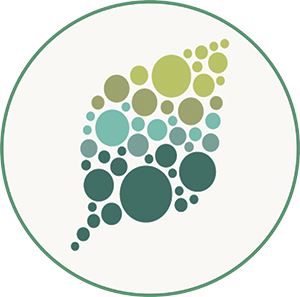 Folates are soluble B9 vitamins with essential functions in all kingdoms of life—both in organisms that produce these vitamins de novo (fungi, plants, and most microorganisms) and in those that do not (animals). As essential cofactors in one-carbon transfers, different folate species mediate the biosynthesis of multiple biomolecules, including nucleic acids, amino acids, and lipids. Folates also play key roles in the methylation of DNA, proteins, and lipids. With such fundamental roles, it is not surprising that deficiencies of this vitamin have severe consequences. Cellular folate levels must be tightly controlled to match supply with demand. Dihydrofolate reductase-thymidylate synthase (DHFR-TS) is a bifunctional enzyme involved in both folate metabolism and thymidylate (dTMP) biosynthesis in plants (Ravanel et al., 2011). The DHFR moiety catalyzes the conversion of dihydrofolate (DHF) to tetrahydrofolate (THF) using NADPH as an electron donor, whereas the TS moiety catalyzes the conversion of deoxyuridine monophosphate (dUMP) to dTMP using 5,10-methylene-THF as a one-carbon donor (see figure). In an effort to identify mechanisms that regulate folate availability in plant cells, Gorelova et al. (2017) characterized the three DHFR-TS isoforms encoded in the Arabidopsis thaliana genome (THY1–3). THY1–3 displayed both overlap and specificity in their subcellular and tissue type localization, suggesting that each THY isoform has specific roles during plant development. To examine the functions of the THY isoforms, the authors isolated T-DNA knockout mutants for each of the three genes and generated thy1 thy3 and thy2 thy3 double knockouts and gain-of-function mutants overexpressing the genes under the constitutive 35S promoter. Whereas none of the single knockouts displayed an aberrant phenotype under normal growth conditions, DHFR activity was reduced in the thy2 and thy2 thy3 mutants compared with the wild type. However, all of the knockouts had normal folate levels, indicating that members of the THY family in Arabidopsis are functionally redundant. Plants overexpressing THY1 or 2 appeared normal, whereas those overexpressing THY3 exhibited developmental delays and reduced growth. Surprisingly, while DHFR enzyme activity was elevated in the THY1 and 2 overexpressors, it was reduced in the THY3 overexpressor. Furthermore, folate levels were normal in the THY1 and 2 overexpressors, but drastically reduced in the THY3 overexpressor. These findings indicate that THY3 is a catalytically inactive enzyme that inhibits the ability of its homologs to catalyze the formation of folates, a conclusion supported by in vitro assays. Besides this in-depth characterization of the THY isoforms, the authors present evidence that folate metabolism contributes to NADPH production, and hence redox balance, through the reaction catalyzed by methylenetetrahydrofolate dehydrogenase (MTHFD; see figure). This finding parallels those of a recent study in animal cells showing that folate metabolism mitigates oxidative stress by contributing to NADPH production (Fan et al., 2014). 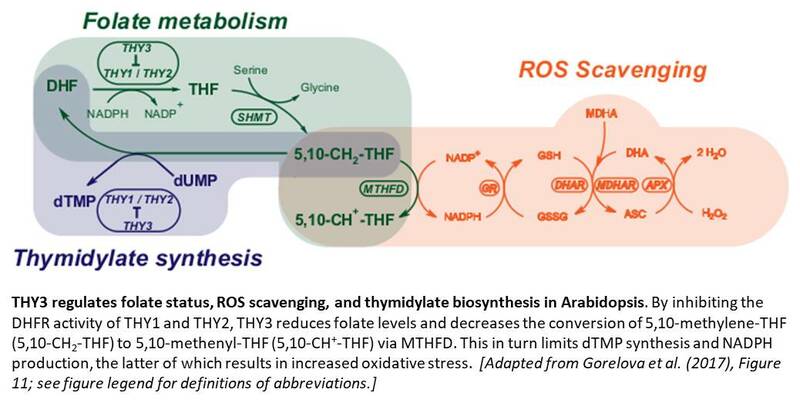 The authors propose a model (see figure) in which THY3 acts not only as a regulator of folate metabolism, but also of ROS scavenging and thymidylate synthesis. Future work should examine the mechanism by which THY3 blocks the activity of its isoforms and investigate whether similar mechanisms exist in plants that lack THY3 homologs. Fan, J., Ye, J., Kamphorst, J.J., Shlomi, T., Thompson, C.B., and Rabinowitz, J.D. (2014). Quantitative flux analysis reveals folate-dependent NADPH production. Nature 510:298–302. Gorelova, V., De Lepeleire, J., Van Daele, J., Pluim, D., Meï,C., Cuypers, A., Leroux, O., Rébeillé, F., Schellens, J.H.M., Blancquaert, D., Stove, C.P., Van Der Straeten, D. (2017). Dihydrofolate reductase/thymidylate synthase fine-tunes the folate status and controls redox homeostasis in plants. Plant Cell: doi.org/10.1105/tpc.17.00433. Ravanel, S., Douce, R., Rébeillé, F. Metabolism of Folates in Plants. (2011). Advances in Botanical Research 59:67–106.